For me the formation of Conferences North and South has brought new life to many teams, and it helps in terms of image, I think, to be associated with the ‘Nationwide Conference’. There can’t be many football supporters, even those who believe ‘proper’ senior football starts and ends with the Premiership that will not have heard, at least, of the Conference. Marketing semi-pro clubs is hard when names like the Southern or Isthmian leagues mean nothing, especially when the sponsors brand obliterate the traditional name. However, for those of us who’ve been following non-league sides for a while, there was one down side to reorganisation, particularly for those of us who were in the geographically chaotic ‘Southern’ league. There are some that welcomed shorter away trips, but I loved the big days out piled into the back of the van. In my last season as a local Havant resident, I had two very enjoyable midweek trips to Tamworth and Stafford, which are much nearer my current home on Merseyside. Anyway, reorganisation has rendered these trips out of bounds unless certain stages of the Cup and Trophy are reached, and many old friends have been lost to Conference North. So when looking for games to attend in the Northern half of pyramid level 6, I do like to look out for former Dr Martens League sides visiting the North West. Today, having bundled to Ashton-under-Lyne station, I had a choice of two. 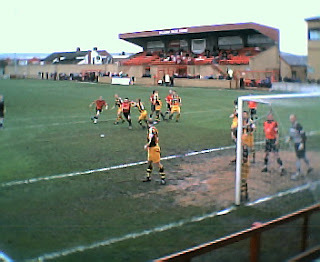 Either a walk round the corner to see Ashton United take on Moor Green (where a quality beano was had a few seasons ago, although mainly in nearby Solihull) or jump on the bus to Droylsden to take on Hinckley (a very pleasant memory of us carving them up 4-2 at their Middlefield Lane will live long). In the end, with time to spare, the Butchers Arms was chosen as the venue. 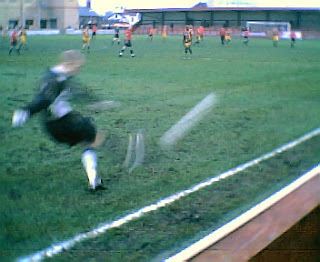 The game was pretty lifeless, Droylsden scrambling in the only goal just prior to half time. It is difficult to believe that the Hinckley side on show today were the same side that put Torquay out of the cup and even took Martin Allen’s Brentford to a replay on live BBC TV. Furthermore, the game wasn’t helped by an over-officious referee, I am not ever keen to criticise refs, falling very much on the ‘no ref – no game’ side of the argument. Partisan support does leave people blind to certain things, and being a neutral a great deal of the time I like to think I can offer an unbiased perspective. I always laugh when people shout ‘we’ve not come to watch you, ref’, but today’s official, preening like a lioness for the full 90, did appear to enjoy the small amount of attention that being a Conference North ref brings. I wasn’t the only one frustrated, with both sets of supporters complaining about him ruining the game. 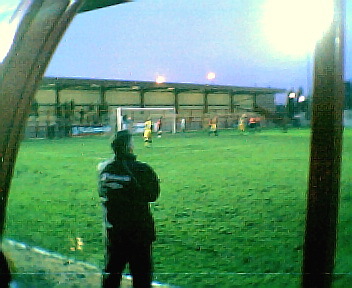 Furthermore when I stood next to the Hinckley dugout, it was clear that their manager Dean Thomas, the former Wimbledon, Northampton and Notts County dogger, was also less than happy. After the linesman ran all the way from his stop point on the half way line to ask the squat, stocky, moustachioed hero to stay inside his technical area (having stepped in the foot-long gap between it and the touchline) he informed the linesman that “you three really have been crap today”. However all seemed jovial, as Dean allowed his foot to creep an inch outside the technical area and would then quickly withdraw it when the linesman looked over and it was smiles all round. As we entered the final minutes, and he was urging the Hinckley team to get forward and pursue an equaliser, he forget himself and was about 2 feet onto the pitch screaming at his players. The linesman flagged, informed the ref, and our squat and stocky moustachioed hero was sent off, showing not anger but genuine dismay at the decision. Prior to all this, in response to a supporter’s question regarding the game being spoilt, Dean replied “‘is it any wonder why players and managers get sent off for dissent with c**** like him refereeing”. I’m not sure if his dismissal counts as dissent, but I think, if you asked him, he’d be unmoved on his choice of descriptor.